Context menu: When you right-click on a list. The dialog has a Position tab that allows you to select an individual level and make adjustments to its indentation, alignment, and what follows it. The settings can be applied to 10 different levels or all the levels. Step one is to access the Position tab. This can be found in the Bullets and Numbering dialog, which allows you to define settings for 10 levels. Before you make adjustments to these settings, you need to choose the bullet or numbering style you want for each level. Click the desired list. Or click the desired point in the list, if you are only going to make changes to one level. When the Bullets and Numbering dialog opens, and the Position tab is selected, click the level you want to adjust in the Level list. Use any one of the other tabs to set the bullet or numbering style. This was covered in the previous blog. The item sets how far to the right of the left margin the bullet or number is indented. The setting will affect every point at the chosen level. By default each level is indented .25 inches. Level 1 is .25 inches; level 2 is .5 inches. After selecting the level in the left column of the dialog, type the desired indentation distance in the Aligned at text box. You also can use the up and down arrow buttons. Each click changes the indentation by .01 inches per click. This drop-down menu has three choices. This affects the positioning of the numbers or bullet points. This drop-down menu has three choices. It sets the amount of white space between the number or bullet point. This is the point where the text starts. It is measured in inches. Type in a the desired tab stop, or click the up and down arrow buttons. Each click changes the measurement by .01 inches. By default, the tab stop is indented .25 inches further than the number or bullet point. The toolbar is LibreOffice’s advantage over Word. It allows you to rearrange points in a list without needing to use copy, cut, and paste. Word does not have these tools; it requires you to cut, copy, and paste text to rearrange points. It allows you move points up or down a level. You can promote or demote a point a level. You also can move it above the point that is above it or move it below the point that is below. This will move a point to a lower level, so it becomes the sub-point of an item that precedes it, if that item was on the same level. LibreOffice can have lists with up to 10 levels. The icon will be inactive when a cursor is on a level 10 item. This moves the item up one level in a list’s hierarchy. If an item below it was on the same level as it, that item will now become a sub-point of the newly promoted item. If the cursor is located on a level one item, that item cannot be promoted. The icon will be inactive. This will move a point, and any sub-points, down one level. If the cursor is on an item that has a sub-point at level 10, this icon will be inactive. This will move the item where the cursor is located up one level and move any sub-points under it up one level. If the cursor is located on a level one item, neither that item nor its sub-points can be promoted. The icon will be inactive. This will move the item below the item it is currently above. It does not matter if the point below it is at a lower or higher level. An item at level 3, that is directly above an item at level 6, will be moved below the level 6 item. It will remain a level 3, and the level 6 item will remain at level 6. This will move an item above an item it was directly below. It does not matter if the item directly above it is at a higher or lower level. As in the Move Down icon, both items will remain at the same level. This will move an item, with all of its sub-points, below the item, at the same level, that is below it. If item A is at level two, and it has five sub-points, it and those sub-points will be moved below item B and its sub-points. Item B is also at level two. This will move an item, with all of its sub-points, above the item, at the same level, that is above it. If item B is at level two, and it has five sub-points, it and those sub-points will be moved above item A and its sub-points. Item A is also at level two. This is for placing an unnumbered item, at the same level, below a numbered or bulleted item. Place the cursor at the end of an item that you want an unnumbered item to be below. Then click this icon. The cursor will start a new line below this item, with the cursor in the same position as the farthest left character in the preceding line. This works for both bulleted and numbering lists. This will start the numbering of the item where your cursor is located at “1”. The items at the same level below it will be numbered “2” and so on. Sub-points will not be affected. Microsoft Word has the same capabilities. This icon launches the Bullets and Numbering dialog. Numbering, bullets, and multilevel list settings for Word are in separate dialogs. The multilevel list dialog is the only one that allows you to change the indentation and alignment. The first step is to click on the bullet or numbering item. Then click the arrow in the Multilevel list icon. It is located in the Home ribbon. Click the Define New Multilevel List item. Regardless of whether you are editing a simple bulleted or numbering list or a multilevel one, this dialog is the one that allows you to make adjustments to that list. 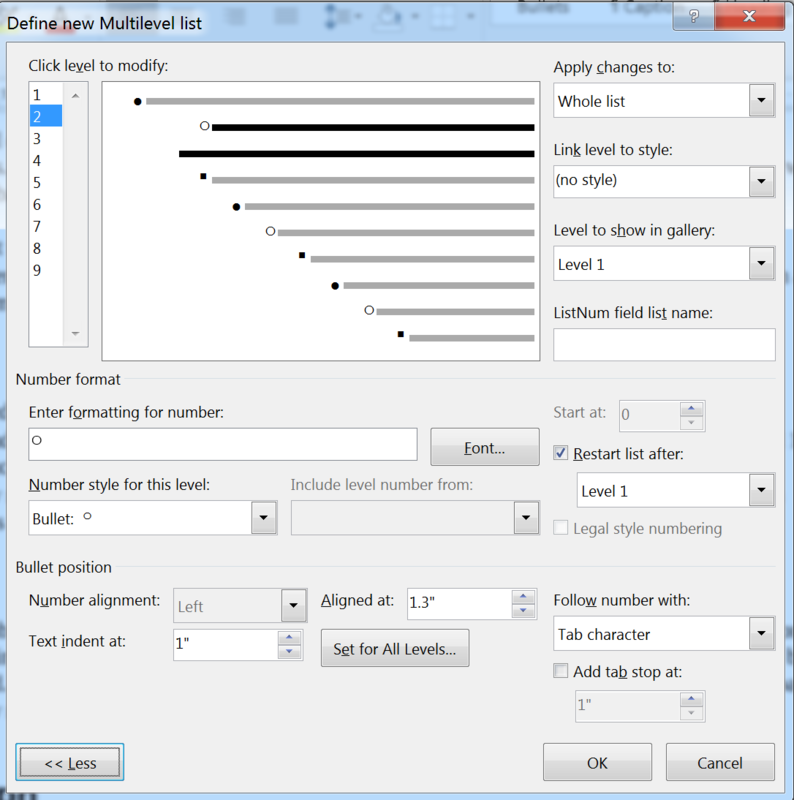 The multilevel dialog allows you to make adjustments to bullet and numbering lists, as well as multilevel lists. It is designed to work with hierarchical lists with sub-points. 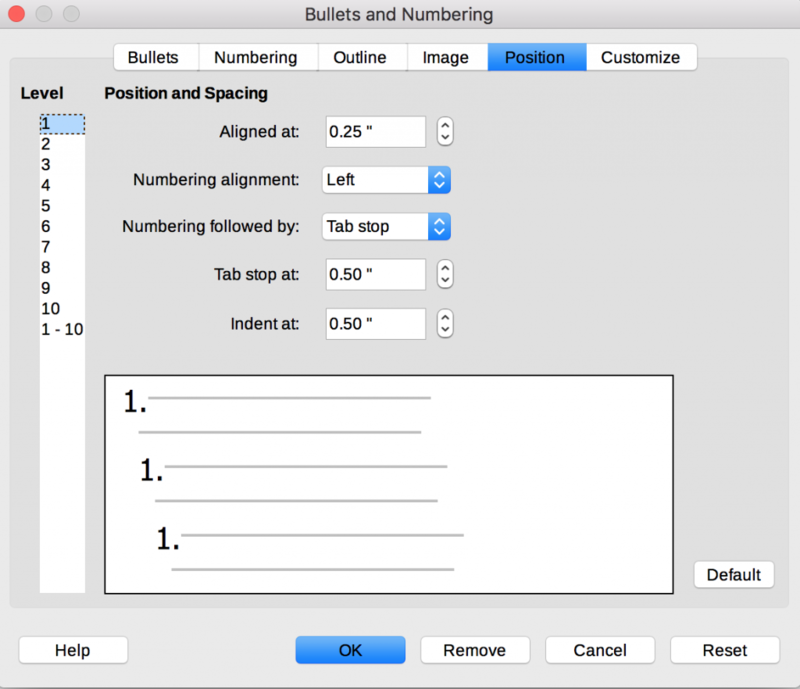 To make adjustments to a simple number or bullet list, the level needs to be set to 1. It has several settings. More settings are revealed when you click the More button at the bottom, left of the dialog. After it is clicked it will change to a Less button. This setting gives Word the advantage over Writer when it comes to adjusting an individual point or the entire list. Whole list: This is the default setting. This allows the settings to change all the points at the chosen level. This point forward: This means that the settings ahead of the point where the cursor is located will not be affected. Current paragraph: Each point is a separate paragraph. This settings means only the point where the cursor is located will be affected. LibreOffice does not have a setting in itsPosition tab that allows you to adjust an individual point. Its settings affect all points at the designated level in a list. To change an individual point only, you need to use the the Paragraph dialog. This has three choices, and it is only active when the cursor is placed in a list item that is a number. It sets the positioning of a number or bullet for a point or multiple points at a level. This text box lets you set how far the numbers or bullets will be indented. Either type in the desired inches or use the up and down arrow buttons. Each click adjusts the indentation by .1 inch. This allows you to set where on the page the text will start. By default, level 1 is at .5 inches. Adjusting the Aligned at setting sets the indent of the text farther to the right. 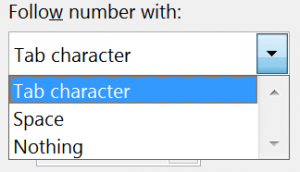 The drop-down menu allows you to choose one of three things which follows a number. This appears when you click the More button. This check box is the second item that appears when you click the More button. A check in it activates the text box below it where you can set where you want the tab stop to be located. It will set where the next level begins when you press the tab button on your keyboard. Follow number with must be set to Tab character for this to be active. When the contents of a list and the order of the items in it are being developed, LibreOffice Writer is the better choice. It has the Bullets and Numbering toolbar that allows designers to promote or demote an item in a list. It also has tools to move a point or a a point and its sub-points up or down in a list. This is very useful when you are working at getting all the ideas in the right position. Using these icons is much easier than moving text by cutting and pasting it in a list. This is the technique Word users have to use. After the list items are in the right order and in the right level, Word gives designers more options for indenting and aligning them. The Apply changes to list allows users to make adjustments to the entire list or to just one point. It also allows you to apply paragraph styles to individual points or every point at one of the levels. The same adjustments can be made in Writer. However, you must use the Paragraph dialog to make them. The adjustments can only be made to individual points or the points you select with your mouse. Changes requiring the Paragraph dialog can’t be easily applied to all the points at one of the levels. The advantages each word processor has over each other is a great argument for using both. The free one, LibreOffice, can be used to design the list, putting each point in the right order. The list can then be pasted into a Word document, or the entire document you are working on can be created or opened in Writer, then finalized in Word. Using two word processors increases the number of features and tools you have at your disposal. This makes document editing much easier.